"Here's an easy dinner my Grandmother used to make. 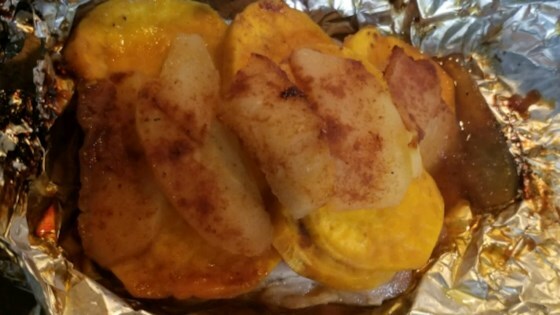 Pork chops are cooked with sweet potatoes, onions and apple in a little foil packet. Very simple and easy to make for one or for the whole crew. Serve with rice." Lay out a piece of aluminum foil large enough to hold the ingredients. Place the pork chops, on the foil, then place the sweet potato, onion and apple over the chops. Fold up and seal each package. This sounds like a "gramma" recipe, but don't you guys know about cooking your food directly on tin foil? It's really not good for you. I've been told the aluminum goes into the food. This was a bit hit with my family. I made extra and they froze really well. delicious and super easy! I added more slices of sweet potato, onion and apple because i found two slices were not enough.